Sen. Sam Brownback hugs his mother Gina Brownback, Parker, during a GOP Clean Sweep party Tuesday, Nov. 2, 2010 in Topeka. Brownback defeated Tom Holland of Baldwin City in the gubernatorial race. As things in Kansas wind down, there are very few races yet to be called. Here’s a wrap-up of where we stand. 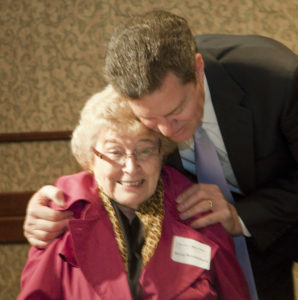 Sam Brownback will be Kansas’ next governor. Check out the precinct results in Lawrence and Douglas County. Jerry Moran will represent Kansas in the U.S. Senate, replacing Sam Brownback. This is one statewide race where some precincts in Lawrence voted for the winner. Lynn Jenkins will return to the U.S. House, representing the 2nd District, including areas of Lawrence west of Iowa. Kevin Yoder will take Dennis Moore’s 3rd District U.S. House seat, representing north and east Lawrence. Stephene Moore won Douglas County but lost handily in Johnson County. Kris Kobach has been elected Secretary of State. He won just one precinct in Lawrence, though most rural precincts in Douglas County. Derek Schmidt will be the next attorney general, despite Steve Six piling up big victories around Lawrence and most of Douglas County. Ron Estes defeated Dennis McKinney to be the next Kansas State Treasurer. McKinney took virtually all of Lawrence and much of Douglas County, but Estes cruised to a large margin of victory. Democrat Janet Waugh will return to the State Board of Education — one of the few Democrats with a district that includes areas outside Lawrence and to have an opponent that won Tuesday night. County Commissioner Mike Gaughan will serve a full term on the Douglas County Commission. The most conservative precinct in Lawrence might be at Corpus Christi Catholic Church in west Lawrence. Voters there preferred Kris Kobach for Secretary of State and Ron Estes for State Treasurer. No other Lawrence precinct chose either of those two. All told, Republicans won every federal position in Kansas as well as all statewide races. The Associated Press is estimating a gigantic Republican majority in the Kansas House as well. All told, the Republican tsunami mentioned on the national level certainly seems to have been true in Kansas. Voter turnout was about 41 percent, which was quite a bit less than the 47 percent of voters who participated in the midterm elections in 2006. In the 2008 presidential race, voter turnout was 62 percent. More than 32,300 people voted in Douglas County on Tuesday. The final count was delayed by the more than 300 overseas ballots that had been faxed to the clerk’s office on Tuesday and then had to be hand counted. Douglas County Clerk Jamie Shew said Tuesday’s voter turnout was moderate to heavy in some precincts. More than 20 of the county’s 67 precincts saw 50 percent or more of its registered voters participate in the election, which is “pretty good” for midterm elections, Shew said. Some were even as high as 60 percent. The county’s overall voter numbers were hurt by the low turnout from Kansas University students. The precinct at Burge Union on KU Campus had a turnout of about 4 percent. According to the Associated Press, the 2011 Kansas House will consist of 91 Republicans and 29 Democrats. 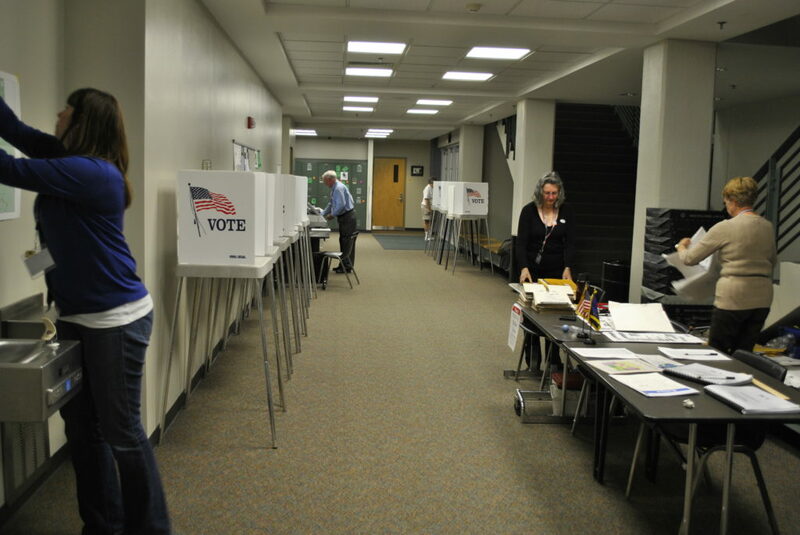 Douglas County Clerk Jamie Shew said Tuesday’s voter turnout was moderate to heavy. Some precincts are expected to have turnouts that are between 50 to 60 percent, which is “pretty good” for midterm elections, Shew said. All but two precincts have been counted, but the clerk’s office has hundreds of overseas ballots that it received today by fax that have to be counted by hand. That’s a process will take some time, Shew said. The Burge Union came in with the smallest turnout percent again. Out of 1,678 registered voters, just 64 votes were cast — 4.1 percent. Below are some photos from our photographers in Topeka. 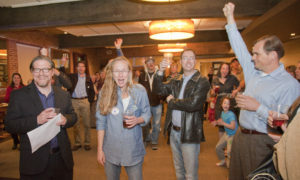 You can see all of today’s election photos here. 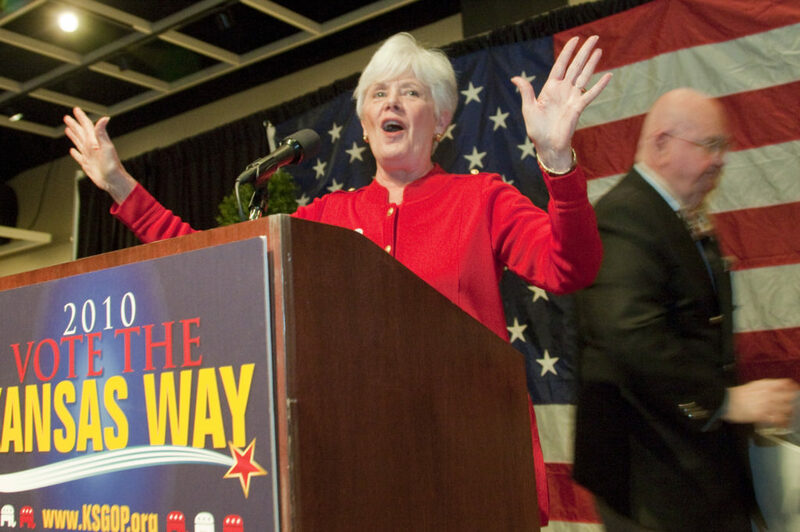 Insurance commissioner Sandy Praeger speaks during a GOP Clean Sweep party Tuesday, Nov. 2, 2010 in Topeka. Praeger said it'll be the first time she's served with a Republican governor. 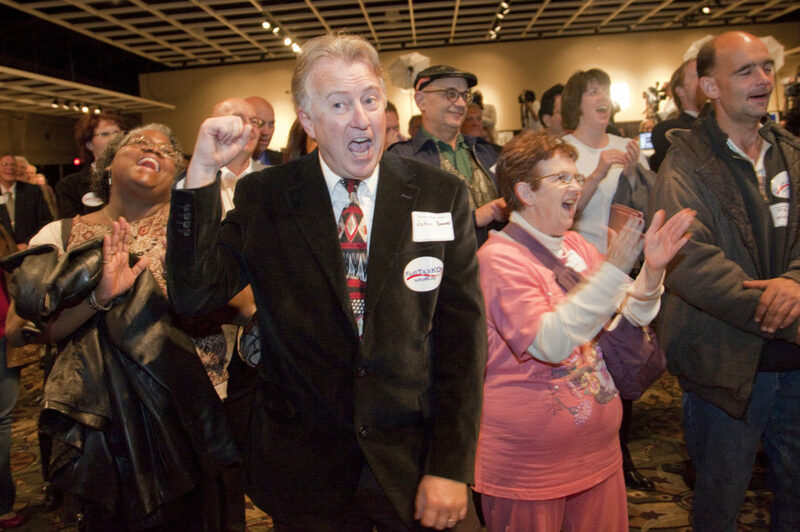 John Bowes, Topeka, center, joins other Republican supporters cheering during a speech by Sen. Pat Roberts during a GOP Clean Sweep party Tuesday, Nov. 2, 2010 in Topeka. With only two precincts left, it appears the Lawrence public library expansion proposal will pass 54 percent (yes) to 45 (percent). The AP has also announced that Tim Huelskamp has won the 1st Congressional District, replacing Jerry Moran. Results are coming in for the Kansas House races. So far, Tom Sloan is leading Linda Robinson in the race for Kansas House District 45. Sam Brownback and Jerry Moran are already claiming victory in the races for Kansas governor and U.S. Senate. 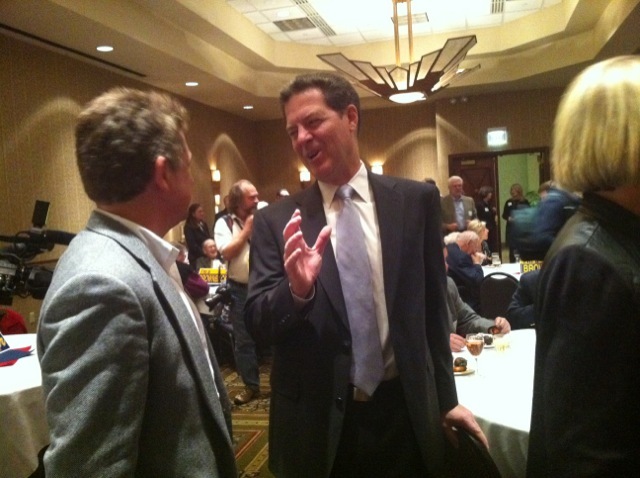 Sam Brownback speaks with friends before his speech in Topeka on Nov. 2, 2010 just before being elected Kansas governor. With race results rolling in, site volunteers were finally able to head home. 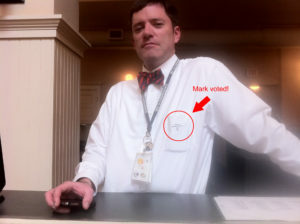 Here are some photos from the final moments at the polls. 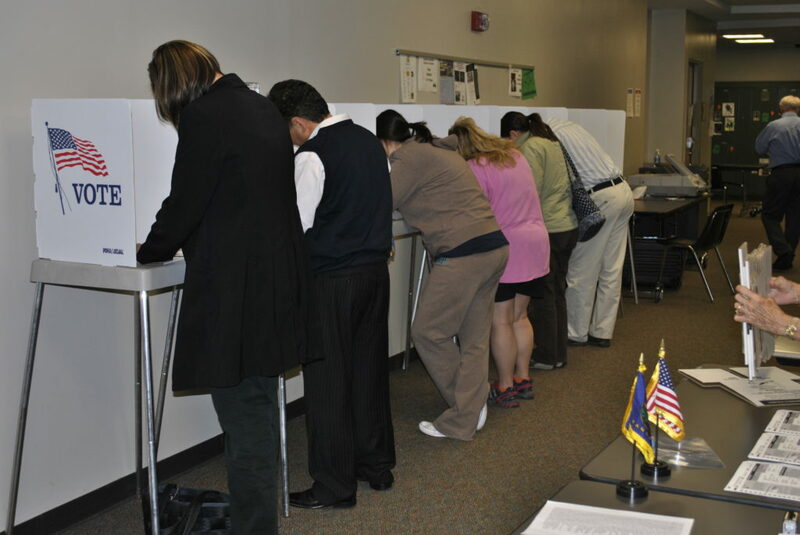 Voters fill out their ballots just before polls close at Free State High School on November 2, 2010. 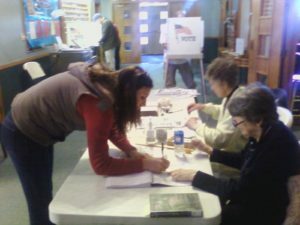 Volunteers begin the clean-up process after a long day helping residents cast ballots at Free State High School on November 2, 2010. Empty poll booths mark the end of election day at Free State High School November 2, 2010. Douglas County Clerk Jamie Shew and helper Michael Kelly run advance ballots at the Douglas County Courthouse just after polls closed for the general election on Nov. 2, 2010. 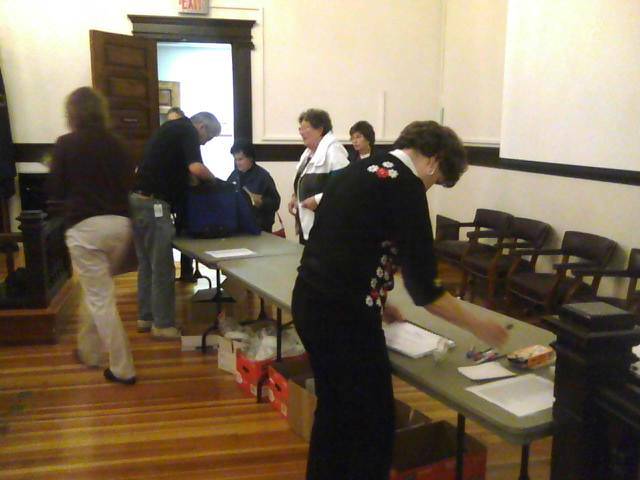 Poll workers arrive at the Douglas County Courthouse with ballots on Nov. 2, 2010. 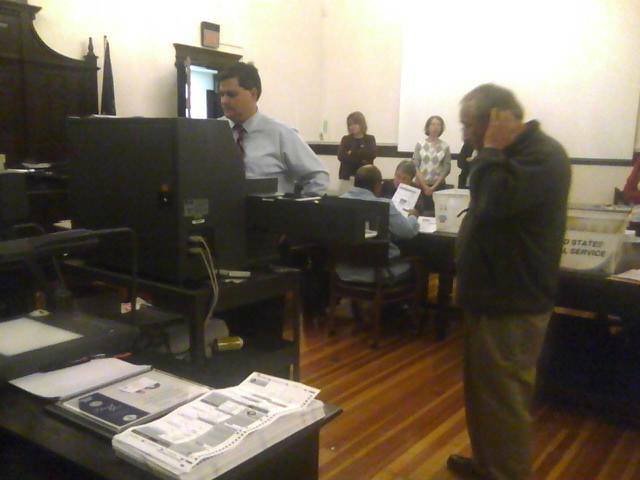 LJWorld.com reporters and candidates are waiting for ballots to be counted at the Douglas County Courthouse. Douglas County Clerk Jamie Shew is now predicting voter turnout to be higher than the 43 percent he predicted earlier this week. Shew said voting levels in western Lawrence were particularly high. “The numbers I’m hearing from some of the west Lawrence precincts, like Langston Hughes, are pretty close to the numbers we had in the presidential election,” Shew said. Shew said numbers in many of the eastern Lawrence precincts are tracking closer to the 2006 midterm election figures. Overall, Shew is still predicting less than a 50 percent turnout. “We still have some KU precincts that will be about 15 percent, which drags down the total,” Shew said. Shew said the election results likely will be later than they have been in past mid-term elections. Eleven old-style voting booths — the kind with shiny metal tables, draped with hard-canvas curtains — finally are relieved of their duties today, now that this polling site (which shall go unnamed, to protect the identities of those working here) is closed. Ever since the place opened at 7 a.m., it turns out, the curtains would collapse — one by one, sometimes on voters as they tried to get inside, others once they’d made their way into short-lived privacy. By the end of the day, all but two had collapsed. And one that had survived unscathed managed to remain intact did so only because nobody used it to vote. The woes were reduced to a mild sense of comedy as the day ended. Whether the booths will be back next year remains to be seen. Alesia Woszidlo votes at Southside Church of Christ. 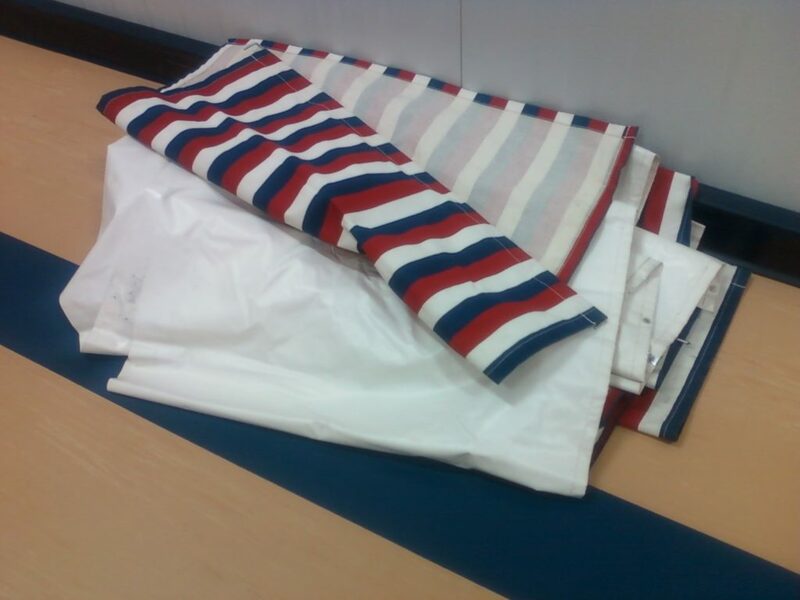 Curtains from collapsed voting booths rest on the floor — out of harm's way. 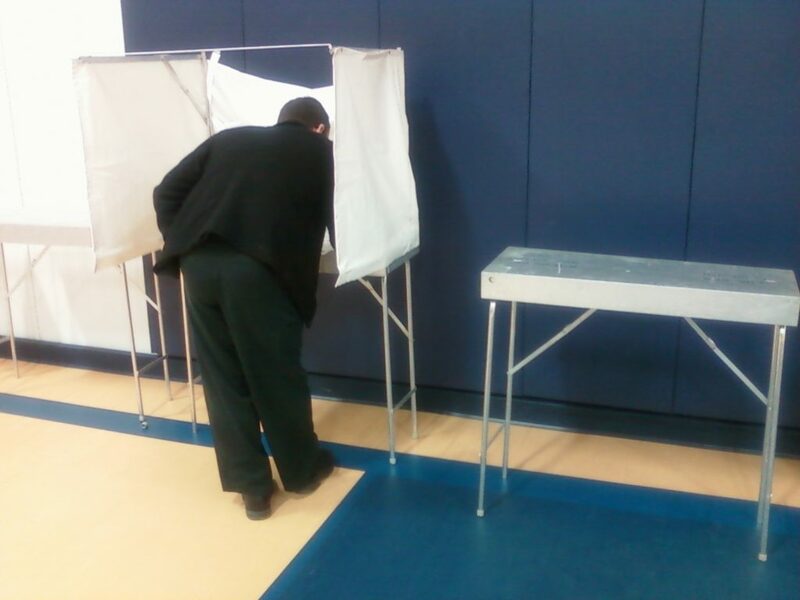 At least one voter avoided the falling canvas at a polling site Tuesday in Douglas County. At right is a both where the canvas already had fallen. Voters at Drury Place Apartments fill out ballots during late afternoon voting Tuesday, Nov. 2, 2010. Douglas County voters said they came to the polls Tuesday because it was their right and responsibility. They also wanted to support the $18 million bond issue to finance the expansion of the Lawrence Public Library. And some had state and national politics on their mind. 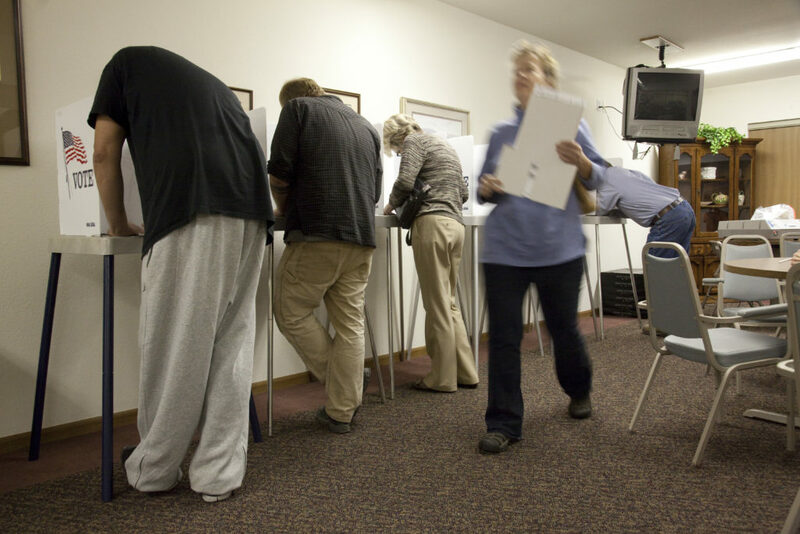 “I’m going to vote against all the policies we voted in because it’s not like we thought it would be,” said Rose Moore, who was heading to the polls at Trinity Lutheran Church in downtown Lawrence Tuesday evening. At around the same time, Sean McCue came to Plymouth Congregational Church to show support for the Democrats. At Kansas University, freshman Lindsey Bloom was exercising her right to vote for the first time. “I’ve always wanted to vote. I used to go with my parents when I was little and they always talked to us about politics,” said Bloom, who specifically registered in Douglas County so she could vote for the library. We’re expecting results to start coming in the next 15-30 minutes. Make sure you check the elections page for the latest race results. 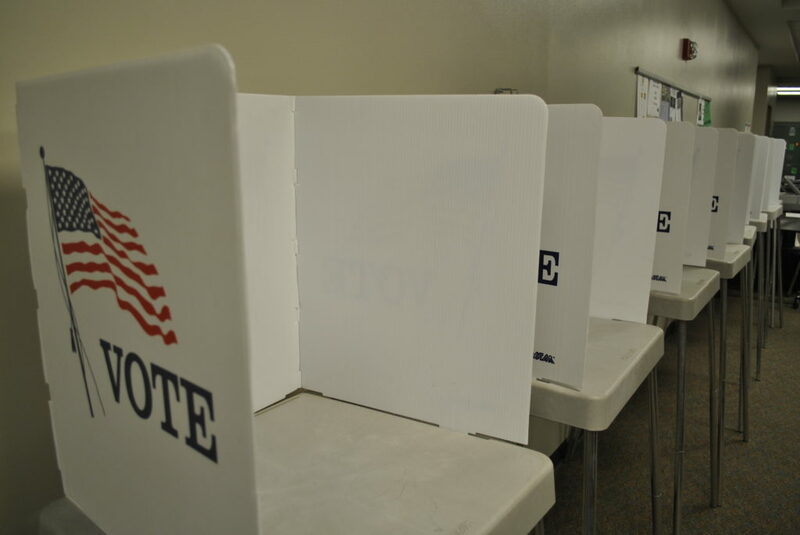 Polls closed at 7 p.m. across the state and candidates are awaiting results in a variety of races. Check [our elections page] for the latest results, and check back with this post for quotes, photos and updates from our reporters and the Associated Press.